As the value of its currency continues to fall and its economy edges nearer to collapse, Argentina’s government is scrambling to establish new measures to protect its currency and to save the country from a long-term recession. The government recently proposed a new plan for the 2019 budget which now includes various initiatives to cut government spending. These measures are largely part of a 3-year financing deal made with the International Monetary Fund (IMF) in July that would provide Argentina with a loan of $50 billion to assist it with the repayment of international debts. Argentine President Macri has already announced an increased tax on exports and the abolition of various government agencies in an effort to reduce the country’s budget deficit; the country’s central bank, meanwhile, has increased interest rates to 60%, the highest in the world (Al Jazeera). Since his rise to the presidency in 2015 President Mauricio Macri has enjoyed a strong economy and high political approval, with his ‘Cambiemos’ coalition maintaining strong congressional support in Argentina’s midterm elections in 2017. After decades of Peronist and leftist populist leaders, many were relieved to accept Macri as president with his grandeur promises to transform Argentina into a leading neoliberal economy. However, 2018 has undeniably confronted the center-right president with some of the largest challenges of his political career. Argentina’s newest episode of economic strife began in April of this year, when the peso’s value unexpectedly plummeted against the U.S. dollar, which had been rising in value worldwide comparably (Reuters). Since a large portion of Argentina’s government debts are in USD, this dramatically increased the value of the state’s budget deficit. This occurred simultaneously with a severe drought, which hindered agricultural production and exports, causing a shrinkage in one of Argentina’s largest economic sectors (BBC News). In tandem, these factors have created the perfect conditions to generate the worst economic crisis that the southern country has seen since its last recession in 2001. As a response to the worsening economic situation, President Macri has announced a variety of austerity measures in compliance with IMF standards to try to stabilize the peso and to prove its allegiance to the fund’s policies. These emergency plans include new export taxes, a hiring freeze, increased subsidies on utilities such as electricity, and the closing of half of the government’s ministries (Bloomberg). Macri has not yet declared which ministries will be closed down as a result of these budget cuts. However, Argentina has one of the highest percentages of public employees in the world; therefore, budget cuts and the closure of government agencies is expected to have a hugely negative impact on the country’s working force (La Tercera). In this chaotic time for the Argentine government, the IMF has pledged its full support to the country (Al Jazeera), agreeing to a plan for a $50 billion loan to fuel a speedy economic recovery under the conditions of certain austerity measures. However, President Macri has vowed to go far beyond the budget cut targets set by the IMF’s 3-year financing plan in an effort to convince the fund’s officials to agree to speed up the payment process (Business Insider). The IMF has already granted $15 billion to Argentina as a part of this payment plan, and is meant to provide another $3 billion next month; however, this may change if the fund decides to comply with Macri’s wishes for a speedier bailout process. While the IMF is in full support of the recent proposals by President Macri, they have not proven as popular with all parties involved. Almost immediately following the president’s announcements, which were expected to restore investors’ confidence in the economy, the peso’s value fell further, having the opposite effect (Business Insider). The peso’s value has now lost over half of its value since the start of the year (Al Jazeera). Early this month, the currency reached an all-time-low of 34 pesos to the dollar (The Guardian), and it is still in a state of steady decline. Perhaps the largest pushback against these reforms, however, have come directly from the Argentine people that make up Macri’s constituency. The falling value of the peso, along with Macri’s plans for dramatic budget cuts, have resulted in widespread protests and criticisms. Many of these protests have been led by students and educators who are challenging proposals of a reduced education budget (Al Jazeera). Additionally, increased subsidies, hiring freezes and increases on export taxes have already begun to negatively affect Argentina’s lower and middle classes who now struggle to pay for basic goods and services. These reforms, along with an ever-increasing inflation rate, mean that consumer prices are rising at a rate of over 30 percent (Bloomberg). If the Argentine peso is not stabilized relatively soon, these changes will indicate a stumble into poverty for millions of citizens. A particularly contentious issue for the public has been Macri’s decision to seek help from the IMF, fulfilling the fund’s requests without reservation. This is primarily because many view the IMF as having played a key role in enacting policies that led to the country’s most severe economic crisis in 2001 (The Guardian). This recession, still fresh in the memories of the Argentine people, left one in five unemployed and millions in poverty. And, while the country has seemingly just recovered from this crisis, many are critical of the institution’s ability to execute policies that will effectively put the economy on the right track in such a dire situation. Macri has already begun with some of these belt-tightening initiatives, and just this week the government presented a new budget plan for 2019. However, it is unsure whether these large-scale austerity measures will even be passed through Congress. At this time, Macri does not have much bipartisan support in the legislature, with members of opposition parties fiercely critical over his management of the crisis (Bloomberg). This recent economic downfall, and Macri’s emergency budget-cutting strategy, has left the president in a critical situation as the possibility of reelection looms in October of 2019. Though he enjoyed relatively high approval in the early years following his election, this most recent crisis has tested his ability as a leader—and the outcome of his proposed austerity strategy will surely be a determining factor in the election. Al Jazeera. (2018 Aug 31). 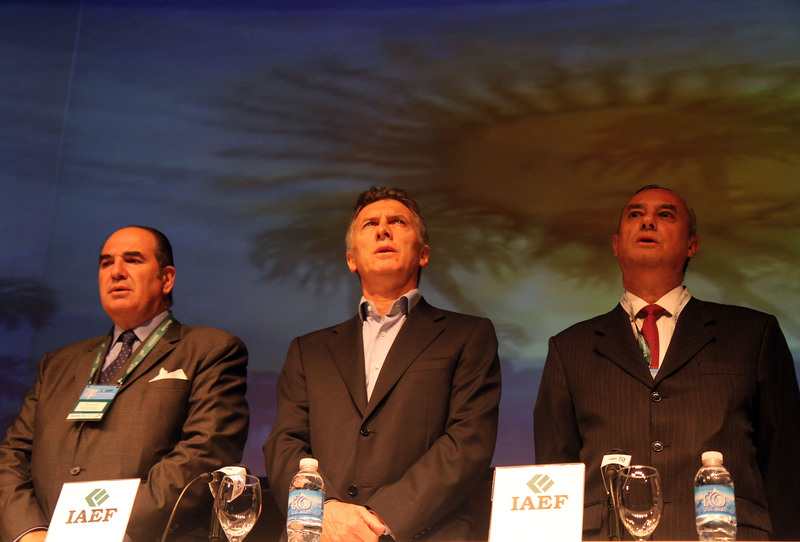 "IMF vows 'full support' for Argentina amid economic crisis". Al Jazeera News. Retrieved Wednesday, September 12, 2018. Luc Cohen. (2018 Aug 28). "Argentina's economic crisis explained in five charts". Reuters. Retrieved Monday, September 10, 2018. BBC. (2018 Sep 3). "Argentina imposes austerity measures in bid to stabilise peso". BBC News. Retrieved Wednesday, September 12, 2018. Patrick Gillespie, Carolina Millan, Pablo Rosendo Gonzalez. (2018 Sep 5). "Judgment Day Awaits for Plan to Avert Argentina's Economic Crisis". Bloomberg News. Retrieved Thursday, September 13, 2018. AFP. (2018 Aug 31). "Cinco claves para entender la crisis del peso argentino". La Tercera Pulso. Retrieved Saturday, September 15, 2018. Will Martin. (2018 Sep 4). "Argentina launched a sweeping new austerity program to try to solve its economic crisis--but investors aren't buying it". Business Insider. Retrieved Wednesday, September 12, 2018. Associated Press. (2018 Aug 29). "Argentina seeks emergency release of $50bn in IMF funds amid financial crisis". The Guardian. Retrieved Monday, September 10, 2018.